We all have that friend. You know the one. He says he doesn’t understand what people are so upset about, that slavery’s been abolished for like 150 years, that everyone’s got the same rights and opportunities in this country as long as they work hard and behave properly. That all lives matter. If you’ve ever yearned for a single book to stuff in this person’s mouth in the hope that they might absorb some truth, We Can’t Breathe: On Black Lives, White Lies, and the Art of Survival is the one. The author, Jabari Asim, has long experience as an editor and writer (for the Washington Post as well as The Crisis), and his research skills are top-notch. This book is extraordinarily well-informed and written in a mode just short of scholarly. It winds patiently between Asim’s life experiences as a black man from a middle-class background and the life experiences of black people across American history, whether well-known (Ida B. Wells, Barack Obama) or obscure (slaves, soldiers). It embeds single great lines, like “what could be more American than pretending truths were self-evident when they seldom were?” and “instead of going high [as Michelle Obama instructed], we should be going everywhere,” in detailed, persuasive essays that must be read attentively. It’s a disservice to Asim’s supple rhetoric to say that one essay is about racial representation in children’s books (“The Seer and the Seen”) and another is about black fatherhood (“Color Him Father”), when all the essays in We Can’t Breathe are about so many things. Blackness, obviously, is the rebar inside each one, but each essay is only loosely organized around a particular subtopic. This is a compliment. The relaxed intentions of each essay allow Asim to draw in evidence and argument from multiple discourses instead of sticking to one area or another. In a lesser writer’s hands, the essays would meander, but Asim is not a lesser writer. His breakout of the differences between white and black art in “The Thing Itself” is especially skilled, ruminating as it does on art by both black and white artists about important figures from black history. Asim’s conclusions are measured and thorough. On Dana Schutz, the white artist who painted Open Casket (about Emmett Till), he writes “I believe it’s possible to defend Schutz’s project without underestimating the larger problem of institutional racism that keeps artists of color out of major museums and exhibitions.” In this same essay, he denounces William Styron’s Confessions of Nat Turner as the product of a “usurper” while taking an I’m-not-sure approach to Kenneth Goldsmith’s disastrous Michael Brown performance. This kind of particularization is hard to come by in an intellectual culture that cherishes pugnacious rhetoric, and as a posture, it’s absolutely necessary for meaningful criticism. Sometimes, I picture in my mind a crimson thread originating in Africa, unspooling alongside a young boy stumbling and choking as his coffle yanks him toward the sea. The thread extends apparently without end, through the bloody spill of centuries and across fruited plains and fetid plantations, trailing the double-time stomp of a black Union soldier and continuing to unspool beside the swollen ankles of a church matron marching her way from Selma to Montgomery. I could see the thread snaking along Pennsylvania Avenue during Barack and Michelle Obama’s stately walk to the White House. It’s a spirit-lifting fantasy of black endurance and triumph, a useful antidote for the Weary Blues. 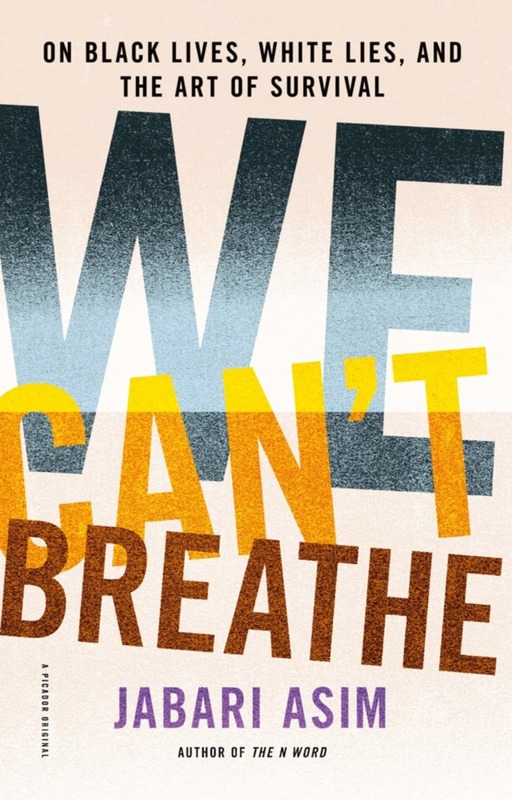 We Can’t Breathe is, itself, a useful antidote—for the complacency and ignorance of white Americans. It stands next to Howard Zinn’s work as a supplement to an educational system that teaches the textbooks of the victors. I can imagine thrusting it at any number of well-meaning but inadequately informed acquaintances when they use the phrases “not that bad,” or “post-racial era,” or “who’s Ida B. Wells?” It’s all right here, Asim assures us. Everything we turn away from, he turns back to us, patiently, intelligently. Relentlessly. Katharine Coldiron‘s work has appeared in Ms., the Times Literary Supplement, LARB, the Rumpus, and elsewhere. She lives in California and at kcoldiron.com, and tweets @ferrifrigida.